Write down exactly what you want in your truck before you head to the dealership. With all the different trims and models that are focused on off-roading, passenger space, hauling, or luxury, it's easy to get off-track once you're browsing the lot. The 2009 Nissan Frontier is a dependable, tough vehicle that can handle a lot in a work situation but isn't out of place in more suburban pursuits. To bring you this inclusive review of the 2009 Nissan Frontier, editors at TheCarConnection.com have compiled impressions from their own firsthand drives and experience with the Frontier, then added some of the most useful highlights from elsewhere on the Web. Here at TheCarConnection.com, you'll find all the information you need on the Frontier and how it stacks up to other trucks. The 2009 Nissan Frontier pickup is derived from the same frame as the larger Nissan Titan. It's actually a mid-size truck, much larger than true compacts like the Ford Ranger. Straight truck lines and some carlike curves around the large chrome-bar grille and at the lower edge of the side-rear windows give the Frontier a good style that's tough and charismatic. Gray plastic and orange markings trim the interior, and though the plastics and fabrics look inexpensive, the design is straightforward and logical. Two engines are offered on the 2009 Nissan Frontier. The optionally available 4.0-liter V-6 puts out 261 horsepower, while the standard 2.5-liter four-cylinder develops 152 hp. Performance spans the range, too, with four-cylinders slogging particularly hard against the truck's increased size and weight. The V-6 Frontier, however, feels strong and passes other vehicles fairly easily at highway speeds. Five- or six-speed manual transmissions are available, as is a five-speed automatic transmission, which never hesitates to find the right gear and go if a burst of power is needed. Fuel economy ranges from 19 mpg city, 23 highway with the four-cylinder manual versions to 14/19 mpg with the big V-6, automatic Frontier. The 2009 Nissan Frontier can tow up to 6,500 pounds. The 2009 Nissan Frontier comes in either rear- or four-wheel drive and in four-door King Cab and Crew Cab versions. The Crew Cab offers a full-size backseat like an SUV, with normal, forward-opening doors, easy entry, and enough space for two adults to sit for extended trips. The King Cab configuration includes front-hinged rear access doors and flip-up backseats, while the latter comes with conventional, rear-hinged doors and a full-sized bench seat. Two small, rear-hinged doors provide access to the cozy space behind the front in King Cabs, where you'll find a backseat that children can be happy with or that two adults can marginally use in an absolute pinch. The driving position is upright and good, and the seats feel more comfortable than in any other compact pickup we can remember. The Frontier offers more than just a bare-bones steel bed in back; the "high-utility" pickup bed includes both a factory-applied spray-in bedliner, while a "Utili-track" cargo tie-down system is a good choice for those who carry small but heavy items in back. The longest bed, though, is six feet long, which limits somewhat its workhorse utility. Standard features on the 2009 Nissan Frontier include four-wheel disc anti-lock brakes and tire pressure monitors. Options include a limited-slip differential, leather seats, a high-powered Rockford Fosgate audio system, and a choice of either XM or Sirius Satellite Radio. Crash ratings are mostly four stars for front impacts and five stars for side impacts. Side and curtain airbags are available as options. Hill Start Assist and Hill Descent Control testify to the 2009 Nissan Frontier's off-roading credentials, and serious enthusiasts will want to check out 2009's new PRO-4X Off-Road model. The 2009 Nissan Frontier offers respectable styling that looks tough and rugged. The 2009 Nissan Frontier doesn't offer styling that stands out much from the crowd, but most drivers will find themselves pleased with what the vehicle has to offer. The Frontier has what ConsumerGuide refers to as a "middle-of-the-pack size"; with its design and style, it "carves out a nice niche for itself in the compact-pickup market." Although it is often referred to as compact class, the 2009 Nissan Frontier is truly a mid-size pickup, offering a six-foot bed and two extended cab lengths, including a King Cab and a Crew Cab. 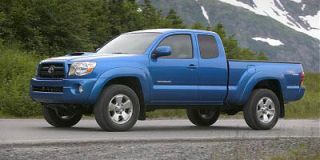 Crew Cabs offer the standard five-foot bed, but the six-foot bed is available on the SE and LE models of this size 2009 Nissan Frontier. Cars.com notices its "grille with angled chrome inserts and chrome-plated bumpers" and "short front and rear overhangs and large geometric fender flares." Edmunds likes its "rugged disposition." Car and Driver appreciates the Frontier's "romp-and-stomp styling." Edmunds is one of the few sources to describe the interior. "The roomy cabins offer straightforward controls, comfortable front seats and an attractive design," they note. 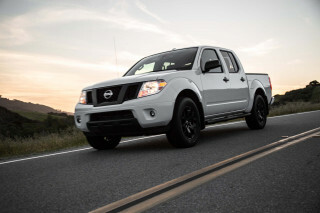 The 2009 Nissan Frontier performs reasonably well, but the optional V-6 engine is a must-have. Most reviewers agree that the optional V-6 engine is a must-have; with this engine, the 2009 Nissan Frontier performs admirably. The 2009 Nissan Frontier is available with a 2.5-liter, four-cylinder that creates 152 horsepower coupled with 171 pound-feet of torque, "making it a decent choice only for those who need a low-cost, light-duty work truck," Edmunds says. The optional engine is a 4.0-liter V-6 that builds up 261 hp and 281 lb-ft. of torque—and this is a must-have if you're planning on using the Frontier for any appreciable amount of work. Car and Driver asserts "the Frontier stands out in its segment, thanks to its excellent 261-hp V-6 engine and its stellar steering and on-road handling." ConsumerGuide makes note of the fact that the automatic V-6 "kicks down quickly for good midrange passing punch." The V-6 engine is also available in a four-wheel-drive option, and as Edmunds says, "Frontier 4x4s are capable off-road, thanks to a maximum 10.1 inches of ground clearance and plenty of suspension travel." New for 2009 is a PRO-4X Off-Road model specifically designed for drivers headed away from the pavement. A five-speed automatic transmission and a six-speed manual transmission are both available on the 2009 Frontier, depending on the trim level and engine size. Edmunds says the six-cylinder's "automatic transmission delivers perfectly timed shifts whether you're maneuvering in traffic or flinging the truck around in the sand." Fuel economy ranges from 19 mpg city, 23 highway with the four-cylinder manual versions to 14/19 mpg with the big V-6, automatic Frontier. The 2009 Nissan Frontier's ride is also better than that of most pickup trucks. Car and Driver points out that the 2009 Nissan Frontier's "structure is extremely solid," and "the steering is tight and accurate." 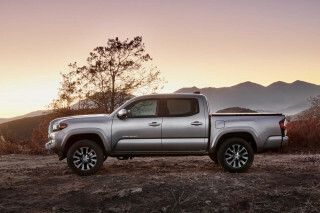 Edmunds reports that "ride quality on pavement is surprisingly good for a compact/midsize pickup truck, and the steering is tight and communicative," and ConsumerGuide calls the ride "absorbent," warning that passengers might notice bumps, but they don't jar like they do in some off-road vehicles. The 2009 Nissan Frontier is lacking when it comes to materials quality, and its bed might be too small for some, but its interior is quite comfortable. The 2009 Nissan Frontier comes in four-door King Cab and Crew Cab versions. The former configuration includes front-hinged rear access doors and flip-up backseats, while the latter comes with conventional, rear-hinged doors and a full-sized bench seat. Reviewers mostly agree on the interior roominess and quality of the Nissan 2009 Frontier. 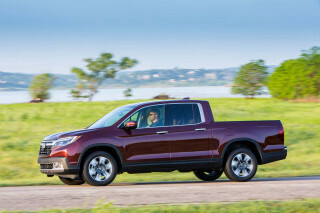 With the extended bed options, the interior of the truck has grown, making it more of a mid-size pickup than a compact truck. The Crew Cab has more interior space than the King Cab, but even in the Crew Cab, the backseat is considered too small or uncomfortable for adults to ride in. The interior is called "spacious" by Edmunds, and ConsumerGuide says there is "good six-footer headroom and legroom" in the front seat. Thoughts on the quality of the interior of the truck are mixed. ConsumerGuide explicitly believes that the interior "looks low-buck" due to hard plastic on most surfaces. On the other hand, Car and Driver states that "interior quality is above average for the segment, as many of the Frontier's interior pieces are shared with the Nissan Xterra sport-utility vehicle." There is also quite a bit of storage space available, both in the bed and the cabin of the Nissan 2009 Frontier. The rear seats in the extended cabs can flip up, providing storage space on the inside, as well as security and protection for important items. The availability of options on bed length (with five- or six-foot choices available) allows the buyer to choose the proper bed depending on the space they need. The longest bed, though, is six feet long, which limits somewhat its workhorse utility. 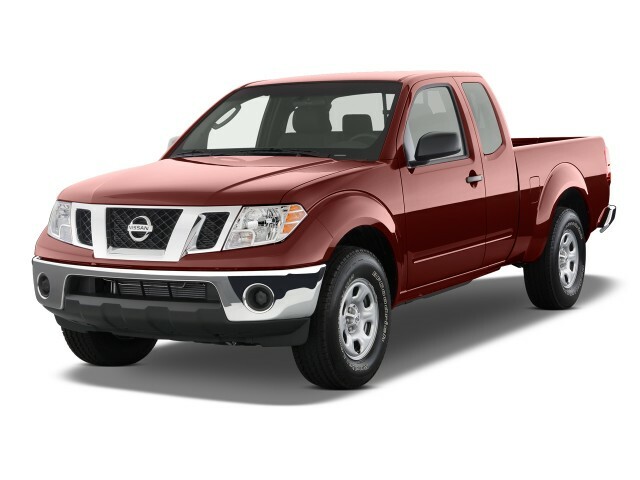 The 2009 Nissan Frontier offers more safety than you might find in other compact trucks. The 2009 Nissan Frontier has more safety features than other small pickups, along with good crash-test results. The Insurance Institute for Highway Safety (IIHS) gives the Frontier its top rating of "good." The National Highway Traffic Safety Administration (NHTSA) rates the 2009 Nissan Frontier at four stars for front impacts and five stars for side impacts. Standard safety features on the 2009 Nissan Frontier include anti-lock brakes and front airbags. Stability control and side airbags—two features not even offered in some small pickups—are available as options, as are curtain airbags. Car and Driver notes that additional safety features that come standard on all trim levels include "active headrests for the front seats," as well as a tire pressure monitoring system and seatbelt pretensioners. Cars.com reports that "all-disc antilock brakes are standard." 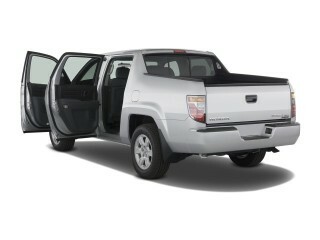 The 2009 Nissan Frontier excels with cargo-bed utility features and offers great sound systems. The 2009 Nissan Frontier offers plenty of great features for drivers of all stripes. Cars.com points out that the utility bed package is "now standard on Nismo-equipped King Cab Frontiers." 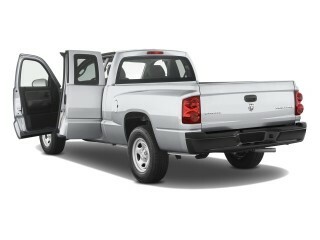 This feature supplies the truck with a spray-in bedliner, as well as a "Utili-track" tie-down system. Edmunds likes the Frontier's "innovative bed features." There are other features available, including a choice of wheel sizes going all the way up to 17 inches. A limited-slip differential, leather seats, a high-powered Rockford Fosgate audio system, and a choice of either XM or Sirius Satellite Radio can be ordered. Car and Driver notes that Nissan "offers a Technology Package." Edmunds observes that "options packages get automatically lumped together," which forces buyers to spend more money on an entire package even if they want only one particular option.